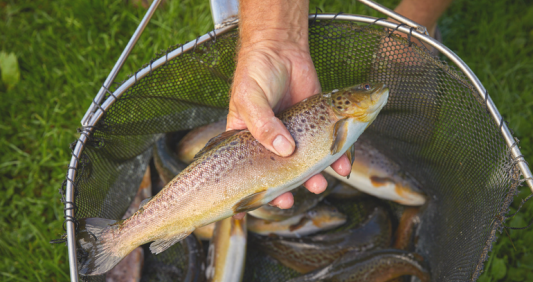 Every year before our fishing season starts our River Keeper lightly stocks our stretch of the River Avon with Brown Trout. This takes a certain amount of pressure of the wild stock that exist. Although we introduce fish to our waters we like to think that they are indigenous given that Wesley Hulme (Pictured) Manager of our Hatchery at Bower Chalke rears our fish using fresh flowing water that enters the River Ebble a tributary of the Avon. Our River Keeper Peter Orchard liaise with Wes to make sure the health and wellbeing of the Trout are to the highest standard so that they are in tip top condition prior to introducing them into our Beat.